robotics-university.com | For program simulation purpose that will applied on a micro-controller chip using Proteus software, we need hexadecimal (hex) file. If we make a program for ATMEL micro-controller like MCS-51 family or AVR MEGA family using BASCOM 8051, BASCOM-AVR, CodeVisionAVR, WinAVR, or the other software on the program compile process will always generate a program file with hex extension. So if we want to simulate that program using Proteus, the hex file ready to use. However if we make embedded systems prototype program using IDE Arduino and compile it, the result of its program compilation can’t using for simulation with Proteus software directly. 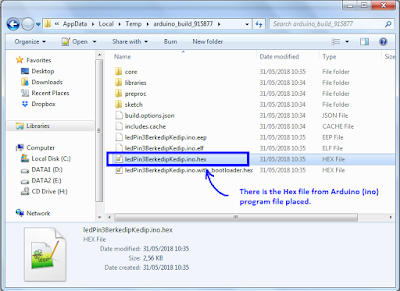 Because the IDE Arduino compiling result of a program is not hex file, but ino file. 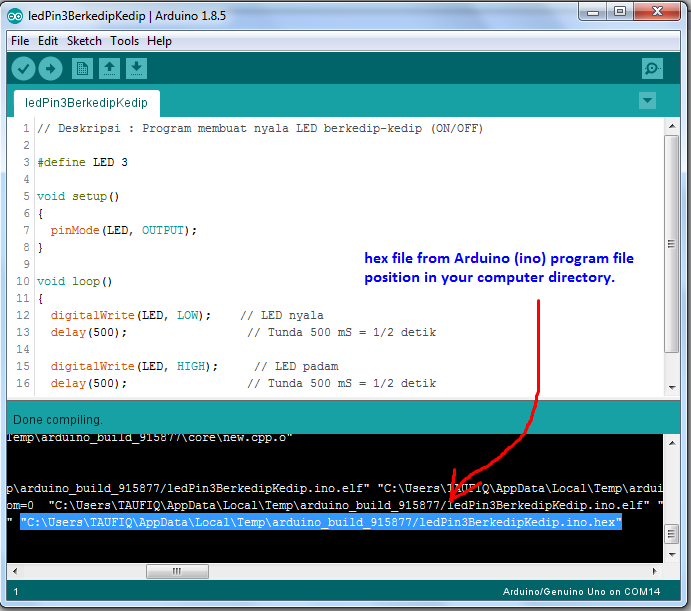 So, how if we want simulate an Arduino (ino) file using Proteus software? The answer is, we have to get the hex file from the ino file that generated by IDE Arduino. 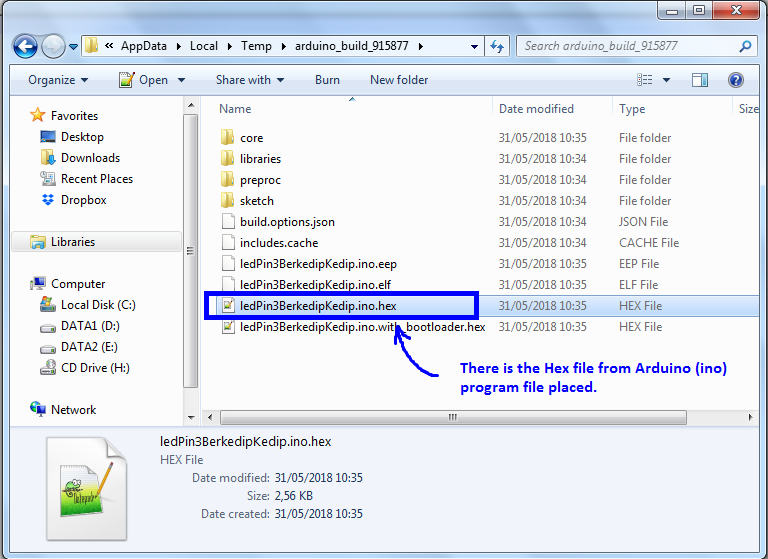 The next question is, “How to get the hex file from the ino file?” Let’s follow this tutorial to get the answer! 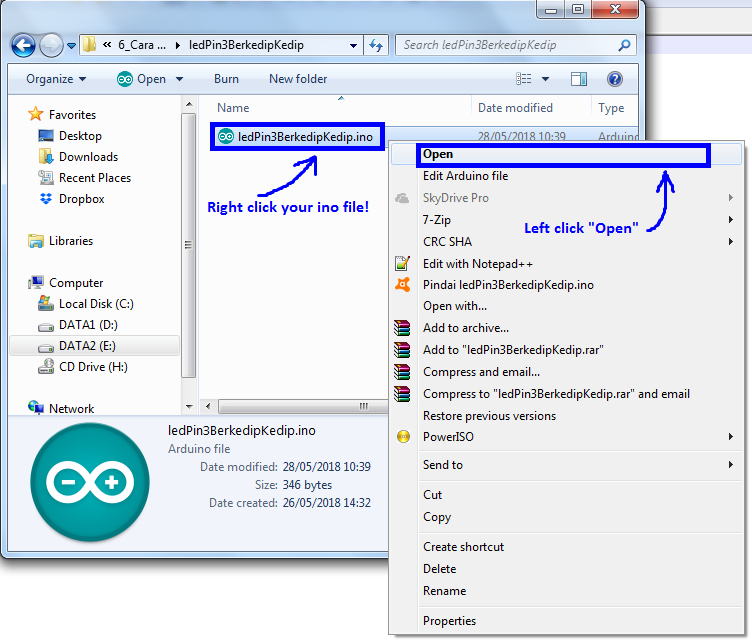 Open your Arduino (ino) program file that you want get its hex file. Open “Preferences” window on IDE Arduino with click “File” menu on menu-bar of IDE Arduino. Then shift down the cursor and choose “Preferences,” as shown on figure 2. 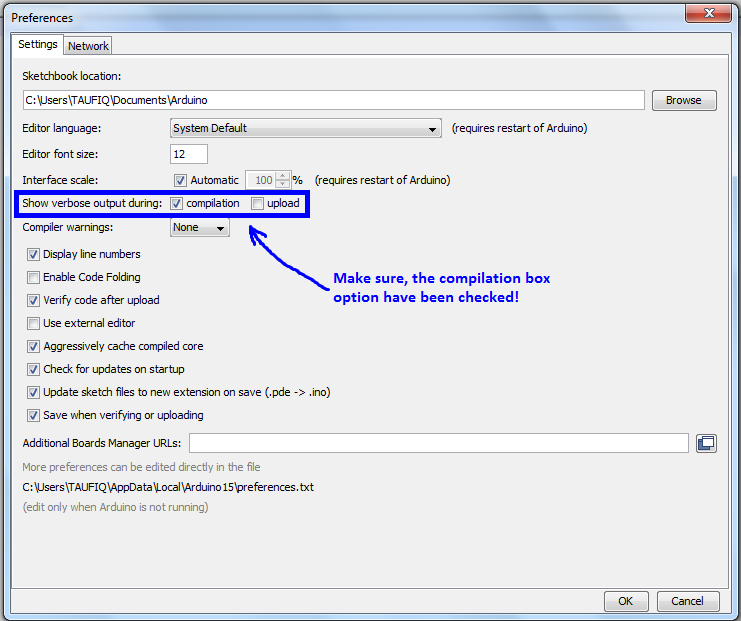 Make sure, that the “Compilation” box option have been checked. See figure 3! To hunt out and knowing hex file directory address of Arduino (ino) program file on the computer that we use, we have to compile Arduino (ino) program file first. Press “Verify” button and wait until program compile process complete. 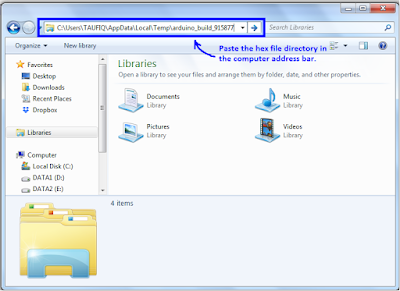 From the address directory, we know that there is a program file with hex extension. The hex program file named with an ino program file (ledPin3BerkedipKedip.ino.hex). Next, copy and paste the address directory in the computer address-bar that we use, then press “Enter” button on the keyboard (See figure 5). 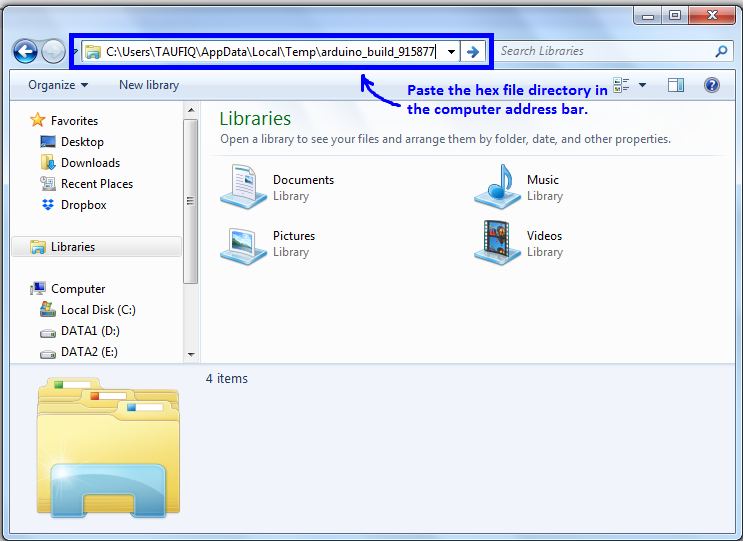 After that, the directory (folder) where the hex program file placed will be open (See figure 6). 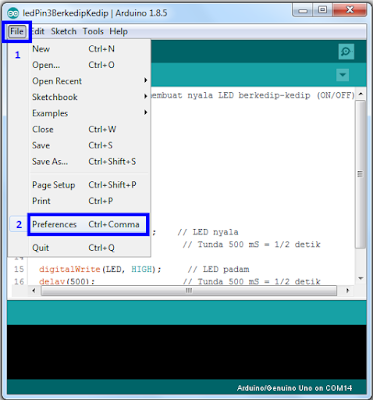 If we have got the hex file of Arduino (ino) program file, we can use the hex file to simulate the program on Proteus software, but don’t forget, you have to use Arduino board library for Proteus. 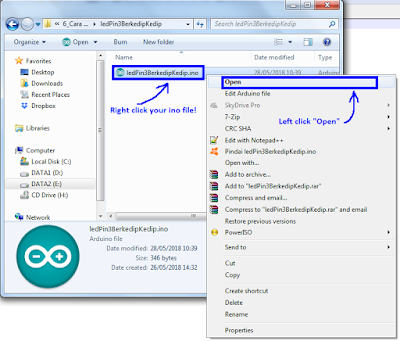 0 Comment For "Get Your Hex File from Arduino Program File (ino)"